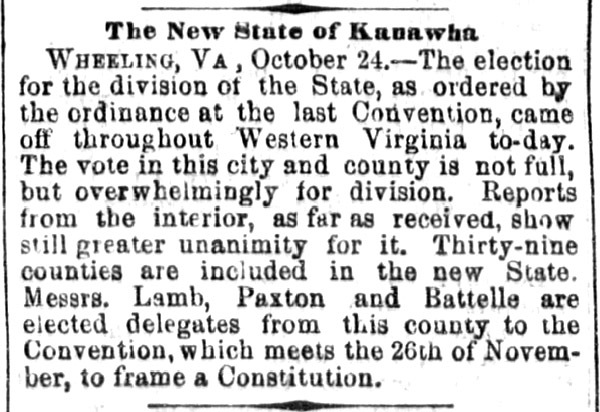 One hundred and fifty-one years ago today, voters in 41 counties of what was then Virginia went to the polls to cast ballots on an extraordinary question: should those counties secede from the then-Confederate State of Virginia and form a new, pro-Union State under the proposed name of the State of Kanawha? The date was October 24th, 1861. The Civil War had been underway for six months. Battle lines between north and south were drawn. Just going to the polls that day — regardless of which way an individual vote was cast — had to have been an act of extraordinary courage. And it had profound effects on the records that researchers may find today in that part of what is now West Virginia. So when you’re researching legal records in West Virginia, remember the vote of 1861. The United States gained a State, but lost in the turmoil were years of records. Every time I see this, I cry, Judy… Kanawha County in West Virginia is where my family is from, and there are big, big holes that hover around this time period. Simple tasks like death records are even a challenge with many records saying name, an approximate age, and no other identifying information. Add onto that the widening of a major federal road throughout WV (US Route 60) and you have another layer of complication to figuring out the how, when, and where of most records. Thanks for a great column on this issue and spotlighting that challenges in the South are not just the legendary “court house fires”. Not every county suffered the same degree of loss, Concetta, but an awful lot of them did. It’s definitely enough to make you cry when you come up against it. All of my mother’s father’s family came from WV and lived there for at least 4 generations. I’ve been to the Archives in Charleston and the WV Collection at WVU in Morgantown several times for a couple of weeks each visit. My mother’s mother’s family was all VA and I’ve been there for weeks, too. At the WV Archives, I was told that the VA method of keeping records continued after WV was formed. If so, we have to remember that the VA vital records which started in 1853 were voluntary. People were not required to record births and deaths. Therefore, these records are somewhere between incomplete and scanty. Also, I heard at both the WV Archives and LVA that in some counties, so few people registered these events that the county officials stopped even trying to keep them. All of this means that the lack of birth and death records is not necessarily connected to the formation of the new state. Far more important would be the lack of court records although there were district courts which may fill in somewhat. Deeds can be recorded later and would have to have been before the land could be sold or inherited. Maybe I have just lucked out but I haven’t noticed any unusual lack of records in that period. My folks were in Monongalia, Pendleton, Lewis, Upshur, Ritchie and Fayette counties. So many VA and WV records have been lost that I don’t cry over them. Sometimes, I get angry when I consider the fire at John Evan’s farm (the Monongalia Co clerk) in the building he’d built to hold his records. I think it was 1794, I’d have to look it up to be sure. When we consider how few records there were at that time, the loss of most of them is awful. Thankfully, the county did work hard to get land deeds re-registered. Also, there are a lot of court records (not the minute books and such but the files and misc papers) not at the Archives but at WVU. So, there are ways around these things. VA researchers always have to deal with “ways around” as so many court houses were burned by Union soldiers. Pretty much all of us have these black holes. You’re sure right that we all have to find our work-arounds, Jo, but knowing what was and wasn’t recorded in the Civil War time period (and why) can often at least stop us from spinning our wheels! What a history lesson! I’ll betcha not too many people would know what you are talking about if you were mention the “State of Kanawha!” You might get a huh? There are a lot of states-that-weren’t, Jeff — all blog posts for another day!! 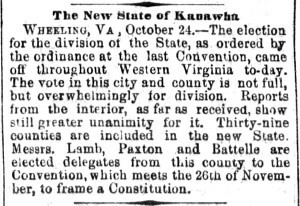 Thanks for the article on the split of West Virginia from Virginia in 1861. Maybe now Ancestry.com will believe that all those counties were once in Virginia. I have not been able to convince them of that so far, so I’ll send them a link to your article. Oh yeah I sure know that problem, Sharon. Good luck with that one!